Uninsured New Jerseyans will have a new tool to help them buy health insurance this fall, just in time for the next Affordable Care Act open enrollment period, a website geared to connecting them with people and resources that can make it easier to sign up for coverage. The New Jersey for Health Care coalition, which comprises 61 community, church, and labor groups, has revamped and relaunched its covernj.org site, adding several features that are intended to help consumers who remain without coverage after the first year of the federally operated health insurance marketplace. While residents won’t be able to buy insurance directly through the site, it provides instructions on how to enroll, including contact information for those who can help residents buy insurance at healthcare.gov. of the site is scheduled to launch by Thanksgiving. Outreach to people who don’t speak English will be a major focus of the second open-enrollment period, which begins tomorrow and lasts until February 15. Toward that end, federal contractor SRA International will offered enrollment assistance in 14 languages. The stakes for violating the ACA mandate to have insurance are increasing this year. While the penalty for remaining uninsured in 2014 was the greater of $95 per adult and $47.50 per child or 1 percent of household income, it will rise to the greater of $325 per adult and $162.50 per child or 2 percent of income in 2015. The first open enrollment period, which ended in April, saw 161,775 New Jersey residents sign up for insurance through the marketplace. But that is only a quarter of the 628,000 people that the Kaiser Family Foundation estimated were eligible. 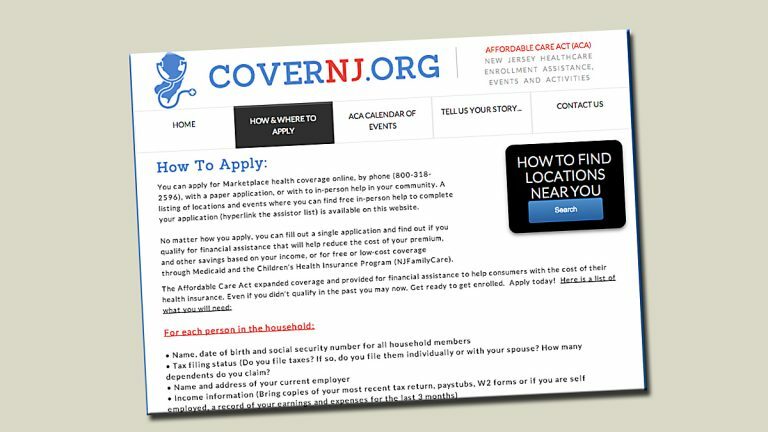 Covernj.org has been completely revamped to make it easier for New Jersey residents to access enrollment assistance, according to Maura Collinsgru, healthcare advocate for New Jersey Citizen Action and spokeswoman of the New Jersey for Health Care coalition. “We’ve brainstormed ways to bring the message to consumers in a more accessible format,” she said. Collinsgru said she’s hopeful that a similar number of New Jersey residents will enroll for 2015 as did this year, but didn’t provide a specific goal. New Jersey Policy Perspective is preparing updated enrollment goals, she said. A challenge to matching last year’s enrollment figures is the fact that many of the best-informed and most-eager uninsured residents have already enrolled. But there are other hurdles that have been reduced. Residents shouldn’t have to contend with a balky federal website this year — instead, healthcare.gov has been streamlined — and those assisting residents have more experience, Collinsgru said. 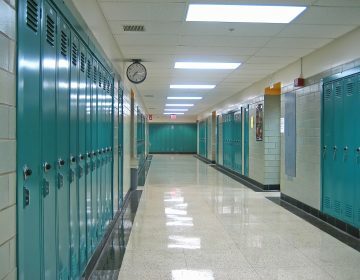 In addition, there will be more federally funded enrollment experts who local application counselors can turn to when they run into problems, she said. While healthcare.gov offers its own list of organizations that can assist with applying for insurance, Collinsgru noted that it includes every organization that has someone who’s undergone training to assist with applications — some of whom may not have the time to work with consumers. In contrast, all of the organizations listed on covernj.org have at least one employee dedicated to helping consumers, as well as the ability to schedule enrollment appointments. The site also carries a list of enrollment-related events across the state, unlike healthcare.gov. New Jersey Gov. Chris Christie decided against having a state-based insurance exchange, which left the state without funds for outreach to uninsured residents. Collinsgru said this increases the role of New Jersey for Health Care, a coalition that is working with a variety of organizations to enroll residents, such as the Center for Family Services, which received a federal Navigator grant to serve residents in seven South Jersey counties, and the New Jersey Hospital Association, which hired 20 military veterans to serve as certified application counselors and who are able to meet with residents to help them enroll, including in evenings on weekends. It also includes HOPES CAP Inc., a nonprofit that’s focused on enrolling Spanish speakers in Hudson and Union County. “A lot of people, although they know about the Affordable Care Act and hear about it on the TV … they don’t know where to go,” said Evelyn Mercado, community services manager for HOPES CAP. The coalition also is hoping to reach immigrants through groups like the United Way of Central New Jersey. Green-card holders who’ve been in the country for more than five years are eligible to purchase marketplace insurance. “There’s been an increased capacity in the number of different languages and bilingual assisters,” Collinsgru said. Collinsgru said an advantage of covernj.org is that the site gathers contact information from many community groups that residents already have a relationship with. The new interactive map is a distillation of this approach. 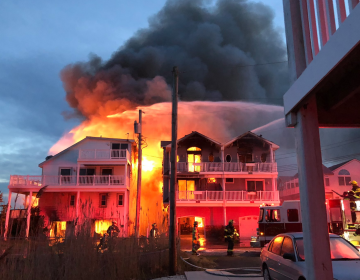 Within a few moments, an uninsured resident can find out that “there’s somebody right down the street from me who can help me with this,” Collinsgru said.